The Heritage Black Bay, first launched in 2012, is Tudor’s best-selling collection. Based on the first 1954 Tudor Submariner (Ref. 7922), along with design elements borrowed from multiple subsequent Submariners, the Black Bay is not a re-edition, instead, it is a contemporary re-interpretation of the original. Building on the success of the core model, last month a day before Press Day at Baselworld, in addition to debuting the Black Bay Bronze, Tudor launched the Black Bay Dark, which like the Bronze, is somewhat of a departure from the rest of the Black Bay collection. Unlike the larger 43 mm diameter bronze-alloy case from the Bronze model, the Black Bay Dark is in stainless steel and has the same dimensions (41 mm x 12.75 mm) as the Black Bay Black, Black Bay Blue, and the original Black Bay (with the red bezel). What largely sets it apart most from its predecessors is the new matte black PVD treated case. Additionally, the bezel triangle is red, like the Black Bay Black, and the writing on the dial has changed. It now reads “200 m: 660ft” in red. And below that, “CHRONOMETER OFFICIALLY CERTIFIED” in white. 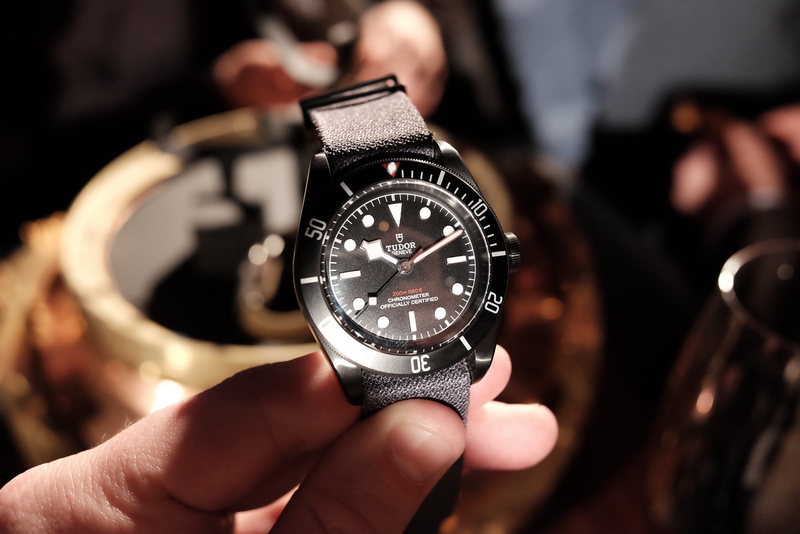 Furthermore, in conjunction with this launch, Tudor announced that all Black Bays will now be equipped with manufacture movements. The new automatic movement, caliber MT5602, beats at 4Hz, has a silicon balance spring held in place by a traversing balance bridge, and a power reserve of 70-hours. The price is $4,150 on an aged black leather strap, and $4,475 on a black bracelet. An additional dark grey fabric strap is included with each model.